I was walking home from the MRT station the other day when a lady stopped me in my tracks and extended her arm. She was holding a small pamphlet and like most of the people who usually stop commuters, I assumed she was handing out commercial brochures, with latest promotions to food or clothes nearby. I casually took the pamphlet (which I usually do this to help brochure givers have a nicer day, it's their companies who are annoying anyway), with the intention of throwing it away after giving it a glance or two. There are not many "sales" that attract me, anyway. Only when I saw the cover did I thought, "Hmm, this is going to be interesting." 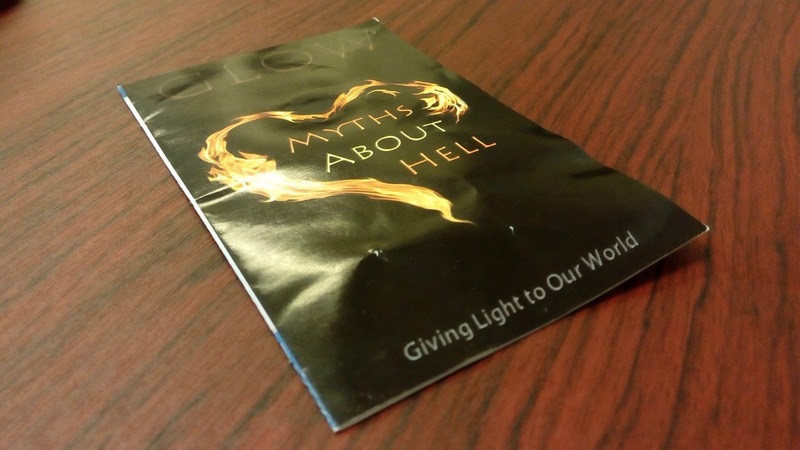 With a black background and a pseudo-heart made up of flames, the tiny pamphlet read “Myths about hell.” And not surprisingly, it was distributed by a Christian organisation, which aims to give light to the world, one page at a time. I suppose it's one of their outreach/evangelisation efforts. The message conveyed by the pamphlet was simple and straightforward, something that I'm familiar with as a Christian for 25 years. The message started with a short introduction of what hell is according to popular culture, which was quickly dismissed as the wrongful idea, followed by tons of quotes and verses from the Bible. We have Matthew, Peter, John, Revelations and even Malachi all thrown in. Nothing particularly new for me, since I have read the bible before, but as I walked home, I cannot help but to reflect on the pamphlet and how effective is this type of evangelisation. Especially to the non-believers, whom I assume should be the main target of these pamphlets (if you're really aiming for drifted Christians like me then okay I have nothing to say). For starters, as a non-Christian, I would very likely have never read the bible before. So names like Matthew, Peter or Malachi have zero relevance to me. Unless they're Matthew McConaughey or Peter Jackson. Their struggles, as well as their significance as the early apostles, would have been lost on me. How am I going to be persuaded by the words of strangers whom I don't know? Also, if I happen to be someone who thinks that the Bible is false (a belief held by a lot of non-Christians), why would I buy into a message that quotes the Bible entirely with no other sources? The message also used the fear method, trying to scare you on how scary hell is, how we all are doomed and then offering a way out through Christianity. We don't need to look far to see how effective the fear method is. Just look at the anti-cigarettes campaign. And this is the problem that I think this type of evangelisation has: We only use our version of the truth, our language and our perspective to reach out to those who do not share the same framework as us. It's unrelatable and alienating. It's like trying to convince someone that Apple is better only using facts and figures released by Apple. It's not entirely wrong, but it's biased and it's beating our own drums. Or blowing our own trumpets. Depending on which musical instrument you like. I can't help but wonder what are conversion rates like for methods like this. I'm not saying that quoting the bible is wrong, but in the art of persuasion or when you're trying to convince someone of an argument, it is always easier if you adopt a reasoning that your target could relate to. If he speaks Chinese for example, you would talk to him in Chinese. If he's a diehard football fan, then you would use a football analogy. It helps to get your message across. Merely sticking to your own position or line of reasoning is only going to alienate your reader. Personally, I dislike these type of evangelisation. It only reinforces the notion that we are a self-absorbed bunch. Christianity needs to change, I feel. Ideally, I think we should return to the days of the missionaries, where people do good for the sake of doing good. Because they believed in the message, not because they feared hell. Trying to scare someone rarely works anymore, it may even backfire. As much as we want to be distinct from the world, we are still in the world. In order to stay relevant, we must understand how the world works too. Instead of just sitting in heaven and asking us to repent, Jesus actually came down and understood how we work, be part with us, ate with us in order to spread the message. So why can't we do that?